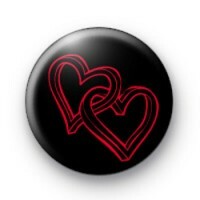 Black button badge with two intertwined love hearts, what could be more romantic? This 1-inch badge would be a lovely simple badge to use in your Valentines crafts or as keepsakes from your Wedding Day. Our badges add flair to any outfit and make perfect handmade tokens of love. So if you are feeling romantic this could be a great badge for you. Be sure to take a look at our other Valentines and Love themed badges as we have quite a few fun (and silly) designs. All our badges are handmade in Cornwall by us (with love).